One of the beautiful things about the Apple Watch is just how many different bands there are for the device, both third-party and made by Apple themselves. Unfortunately for women, many of these bands are gender neutral or geared towards men, not giving you a whole lot options as far as vibrant and girl-like styles go. While they might be a little more hard to find, there are still plenty of watch bands designed for women, it just takes a little extra digging. That’s why we assembled this list for you — to show you all of the best Apple Watch bands for women. If you stick with us and follow along below, we’ll show you our top picks. Let’s dive right in. 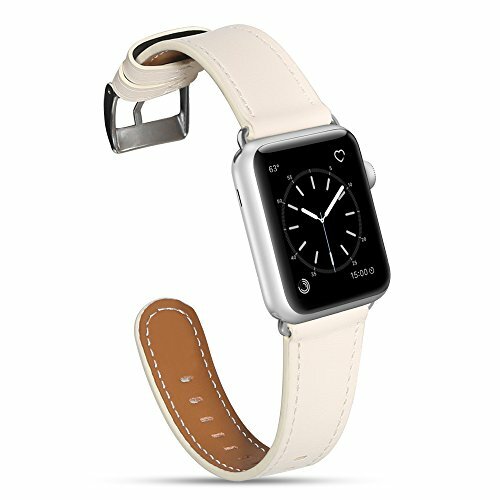 Coming up as first on our list, we have the MARGE Plus Genuine Leather Band — if you’re a big fan of the look that traditional leather bands bring, then you’ll love this Apple Watch band. This one is more of a gender neutral color, but the leather just looks so nice on any wrist. It’s got some excellent craftsmanship in it, giving you a leather band that will last you for years to come — even the stitching here is high quality. This one is made out of genuine leather — as the product name already implies — and then there’s a stainless steel buckle for strapping it down. While you can get it in traditional leather, MARGE does offer some other vibrant colors, like Ivory White and Red. Like how the traditional stainless steel watch bands look when on, say, watches that you purchase from a luxury watch maker? Such as Rolex? Then you’ll love the Oittm Stainless Steel Metal Watch Band because that’s just what it is — a luxury stainless steel band. It’s made out of premium stainless steel, and you can get this in a Bright Silver to really make it shine. Resistant to water, you shouldn’t have any trouble with perspiration ruining it or even rainfall. However, we wouldn’t go trying to dunk it in a pool of water to test its water resistance. Looking for something that has a little bling to it? Look no further than Secbolt’s own Bling Bands. These come in fairly neutral colors, but have some serious spark and bling to them. With a dressy and elegant design for women, each color band is equipped with rhinestones that sparkle. Suffice to say, these bands will give your look a big boost and bring out a ton of compliments. This one is easy to adjust, coming with an adjustment tool, and there’s even a number of different colors to choose from. Coming up next, and handmade right out of California, we have the Apple Watch ‘Stingray’ Band. This one is a really unique band, using leather that looks similar in appearance to a, well, stingray — or alligator. 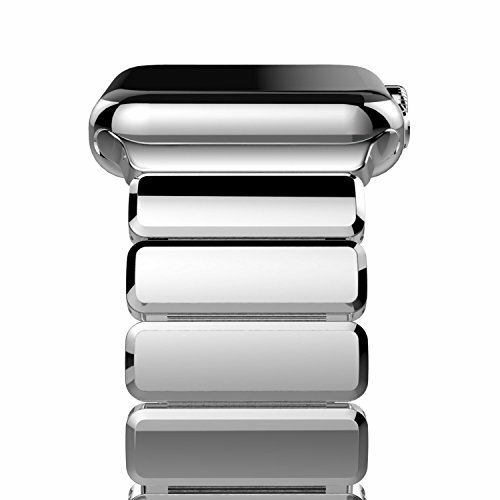 The nice thing about these bands is that they aren’t mass produced — each one is made to order, and is custom made. Like we mentioned, these are made out a really unique leather, or at least a unique crafting process. In addition, these are great choices for women, as there are a number of vibrant and sweet looking colors that you can choose from as well. This one screams handmade luxury, and will look great on any woman’s wrist. Next up on our list is the MAXGET Soft Silicone Breathable Band. Need something that will hold up well during a run, jog or intense session at the gym? 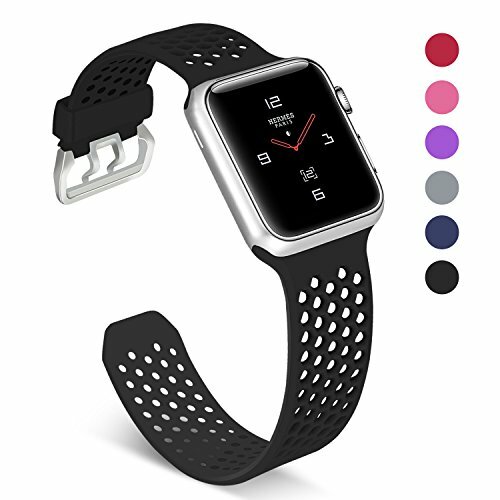 Then this silicone breathable band is for you — since it is made out of silicone, it has a natural wicking to it, which keeps the band from absorbing the sweat. There’s actually a bunch of holes in the silicone, which allows air to reach your wrist and keep the sweat to a minimum. This one comes in some stylish colors for women, such as Red, Purple, and even Hot Pink. You would have no problem using this one for day to day use either. The next contender on our list is the Seoaura Milanese Loop. You might think that this one was primarily designed for men, be Seoaura includes some colors that will make the Milanese Loop attractive to women to. You can actually get it in Gold, Rose Gold, Red, and even a Vintage Gold. We really like the Milanese Loop because it transforms your Apple Watch into something that can easily be taken for a night out on the town or to a business meeting. It’s not a bad option for casual use either. The Milanese Loop actually doesn’t have any buckles on it, and instead attaches together through the use of magnets. It makes it easy to adjust it to any wrist size, and prevents you from having to fiddle with the buckle. And last, but certainly not least we’re taking a look at one of our personal favorites — the AOKAY Replacement Bling Cowboy Chain. If you want to make an excellent first impression, just attach this to your Apple Watch Series 4. 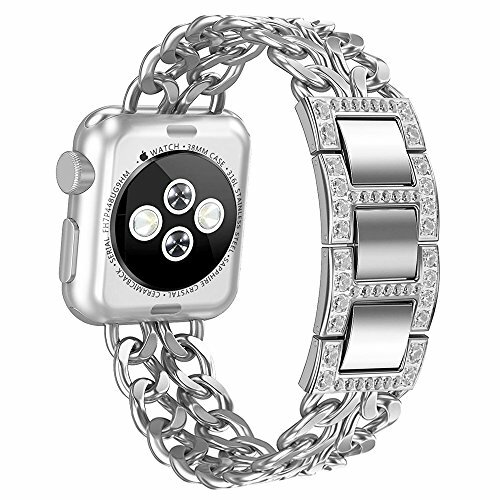 This one is made out of high quality stainless steel, but actually has rhinestones embedded throughout. It makes it really look flashy, and will have onlookers wondering where you got it from! This band comes in the traditional silver color, but you can also snag it in colors like Rose Gold, Rose Gold-Diamond, Gold, and more. 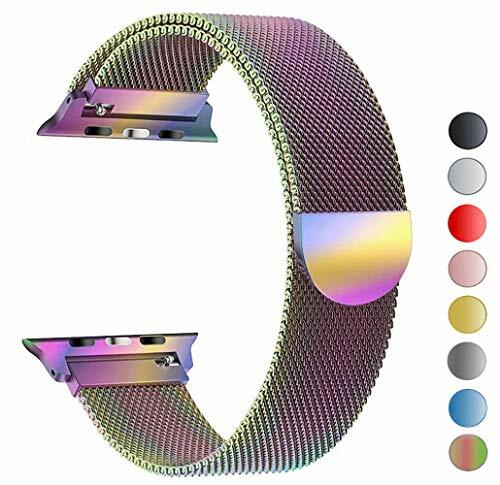 As you can see, there are a lot of excellent Apple Watch bands for women — they might be hard to find at first, but with a little digging, you can find the right colors that really make them a women’s watch band. Do you have a favorite women’s watch band for your Apple Watch Series 4? Let us know what it is in the comments section below!